I recently fantasized about a project that starts from a small solar furnace (small, but can melt steel), and a small solar farm (that control the electronics). Then all the energy is used to build more mirrors and solar cells to extend the power plant's capacity. This way it's capacity can slowly but exponentially grow on free energy. When it grew large enough it could be connected to the power grid and become useful. So are there such projects? While such a project is technically possible, I have to wonder: why bother? There already exists a huge energy infrastructure, warehouses full of photovoltaic (PV) waiting to be bought, electricity transmission networks, mineral extraction and processing plants, and so on. Doing it all from scratch while ignoring available infrastructure looks like putting a purist philosophy above the practicalities. Which is romantic, but it's not engineering. Highly Irregular's answer identifies the Sahara Solar Breeder (SSB) project. Harnessing the 3rd value of the desert for energy: Large scale/low cost production of solar-grade silicon from desert sand. Solar breeder: Construction of solar cell plant doubling its scale every energy payback time (1-2 years at present). There are a few odd things on there. Why go for High Temperature Superconductor (HTSC) for transmission? It doesn't make sense at the moment - it's an excessively complex way of doing things. High-voltage direct-current (HVDC) losses are low over long-distances, and it's a much simpler, more reliable technology. Their target isn't that ambitious - 100GW of capacity in 30 years: the world did that in (about) the last ten years, and is likely to do the same in fewer than the next 5 years - the plan is to get to 300GW of new capacity per year by 2025. It's a useful experiment to prove the concept. It's a useful trial run for a similar project on, say, Mars. But the starting-from-scratch concept doesn't have a lot going for it in terms of providing clean global electricity: why slow down decarbonisation by ignoring all the really useful infrastructure already in place? 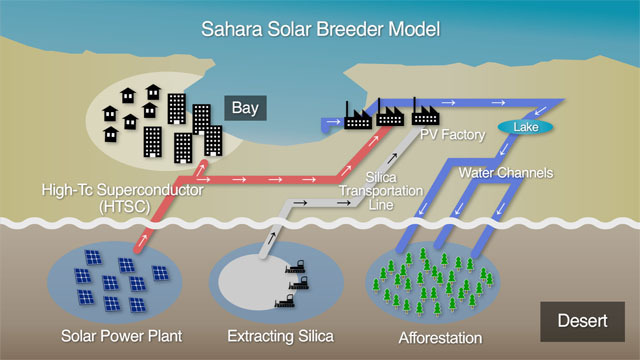 Yes, there is one major project underway, called the the Sahara Solar Breeder. Wikipedia has a small page on it. There seems to be little information about the project since 2010, (perhaps because of the Japan tsunami?) but I did see a mention on their website of progress planned for 2013. There is also a summary of the project in New Scientist and Gizmag. I found a few research papers out there about solar breeder projects in general, but nothing that appeared freely available. My guess is that because there's a lot more to creating and using PV panels than just purifying silicon (materials for protecting the panel, conducting the electricity, control circuitry, accommodation, offices, labour), the additional costs make a solar breeder project prohibitively expensive (at least, so far). No. Or, only just. So far. For good reason. They MAY come. but not soon, and not easily. As much as we all may like to see a numerous and increasing number of "breeder" projects the reality so far is that the only ones that appear to exist turn out to so far be only theoretical and "on paper". Their day is yet to come. Overall such systems do exist on a larger scale but they are interleaved through industry as a whole. That is, rather than having identifiable stand alone systems that self-grow we instead have an industrial society whose energy production capability is increasing and which uses its own energy production to drive this increase. So far this increase is driven by energy from mixed sources - both renewable and non renewable. Increasing efficiencies from solar photovoltaic while using thinner lower material content PV cells. (eg until recently state of the art industrial PV crystalline silicon panels were about 18% efficient but recent back contact cells with improved antireflective methods have resulted in 23%+ efficient commercially available PV cells. Efficiency improvement allows higher energy per area, less maintenance costs from eg cleaning, better land utilisation. Silicon material availability is not usually a primary issue but thinner cells improve yields and allow new variants such as flexible crystalline silicon - double side irradiation etc. Longer life higher efficiency solar thermal plants with eg molten salt heat storage to extend operating hours per day. All these and others will slowly push up the the potential proportion of renewable energy in the global energy mix. However, the massive increasaes in petroleum availability on the last decade or so due to "Fracking" developments and the incipient potential for eg coal recovery by fluid flow methods and the massive potential for deep sea Methane Hydrate recovery also means that the renewable proportion of total energy produced may fall. Breeder reactor methods, and the long long long proposed Thorium Pebble Bed reactor technology while not fully renewable, greatly increases nuclearfuel utilisation. Thorium PBRs notionally have energy production costs "far less than coal". That claim somehow sounds strangely familiar :-). What about the "Sahara Solar Breeder project"? Sadly, while The Sahara Solar Breeder Project is a grand idea that may yet produce some concrete results, so far, it's very largely a pipe dream and research project between some Japanese and Algerian universities. A look at the rather empty Wikipedia page (link above) is not too encouraging. The Sahara Solar Breeder Foundation official website has more pictures and desriptions, but nothing obviously new (2010 copyright date) and has a now passed 1st prototype date with no indication that anything has actually been builyt. A system could be devised that adds to its energy wealth without use of hydrocarbon energy or radioactives except for the getting-going phase but all avaible studies, and all experience to date with alternative energy, suggest that it would be a close fought thing. There are many who argue that there is no net energy gain available in current alternative energy systems such as biomass where long term energy out is said not to match total system wide energy expenditure. eg for biomass energy is expended on planting, harvesting, transportation, processing, storage, waste disposal etc. To make biomass products such as transport alcohol viable subsidies are usually required. It's worth noting carefully that all energy sources that we can access are in some manner area based on "star stuff" at root. Our own Star "Sol" drives wind, hydro, PV, solar thermal, coal and more. Other stars have sourced radioactives. Everything above iron appears to have come from Supernovae. It's also worth noting that that out whole existent infrastructure worldwide is already based on a solar driven breeder system. You may need to refine your assumptions or conditions to eliminate some aspects which are not desired. One obvious questionable point is the use of hydrocarbons obtained by "mining" in some way or another (drill, dig, Frac ...). These energy sources are repositories of stored solar energy - but "we" did not do the storing. Another questionable source is radioactives. These also are "star stuff" - but not from our current nearby Star. The whole of life energy cost of a product can be VERY roughly approximated by expressing its best available initial cost in energy cost terms. eg you can buy PV solar material in vast volume in China for approaching $US0.10/Watt_mp and whole made up panels at around $US0.50 ex factory. This must be more than the cost energy of fabrication IF government or other subsidies are not present. In fact, Chinese solar manufacturing is crucially dependant on state subsidy at present so overall it is likely that PV panels bought in vast volume cost around or even slightly less than the energy cost of production - and that the lifetime energy available from these systems will be somewhat higher than this but not vastly so. A look at real world solar PV realities is not encouraging. eg 1000 Wmp of PV panels costs about $US400 FOB factory at present in large volume. The installed cost of such a sytem in a "western location" is around $1/Watt mp. In a good location mean daily output is about 4 kWh and for a say 20 year design life total energy produced = 4 kWh x 365 days x 20 years =~ 30 MWh. AT $US0.10 wholesale / kWh that's $2920 of electricity for $1000 of installed panel cost over 20 years. At first glance that's a win. However, if you include "cost of money" = which you must, then a simple DCF calculation suggests about $1960 at 5%, $1400 at 10% and $1100 at 15%. At $1/Wmp installed break even is barely reached at 15% - a rate that international financiers of large risky project are liable to expect. Even at 5% the profit of about $900/kW of panels is required to also fund maintenance, cleaning. a significant factor, any early failures and decommissioning. $900 is $45 / year per kW of panels including any profit. That's about 6 square metres of panel. If any one energy source was vastly more cost effective it would dominate world markets and displace alternatives. At present coal, hydro, geothermal are king, nuclear is a special case and the "wannabees" are wind & waves (both a form of solar) and PV & thermal solar. I say nuclear is a special case as all insurance risk has always been underwritten by governments in all installations anywhere, no private insurer will tough the market with a triple length barge pole and in an open market the product could not be sold, no matter how "truly safe" it was. While wind and various solar sources are being used in competition with traditional sources they are invariably assisted by various special tariffs or market distortions or enforced special rates or conditions. Its still hard to compete head on with energetic gooey stuff found for free (initially) in the ground. So, so far, if you can build an escalating self-replicating infrastructure with traditional energy sources, then you can probably do so with "alternate" sources, but it will be harder, or much harder. While it is a work of fiction, Kim Stanley Robinson's trilogy + "Red Mars", "Green Mars", Blue Mars" contains many ideas in the ability to build a world starting with small seed input. He use nuclear, solar, thermal and more on a grand scale. A very worthwhile read from many perspectives. If I've read this correctly, you're claiming that the economics implies that PV has an EROEI of only just above 1, or below it. And in comparing wind with fossil fuel subsidies, you've ignored the subsidies and externalities of fossil fuels. Have I understood correctly? A: @EnergyNumbers Close enough, alas. You can add in fossil fuel etc subsidies as may esist if you wish, but on a level playing field the raw concentrated & stored energy of petroleum makes it hard to compete with. The cost of petroleum is essentially extraction + transport + refining + profit + taxes. You do not largely need to "interact" with the energy source per se and the energy per volume is high these both make the job cheaper and easier. I've added to my answer above with some rough figures for solar. The "trouble" with existing energy sources is that we have tapped the obvious easy ones. Liquid hydrocarbons (petrol, diesel, kerosine) give around 10 kWh/kg or say about 2.5 kWh/kg delivered energy in an internal combustion engine system. Coal delivers lower energy/kg but is still extremely energy dense compared to non chemical-stored-energy alternatives. 2500 Watt hours x 3600 seconds/hour = 9,000,000 Watt seconds !!! of energy. delivers 100,000 Watt.seconds = 27.777.. Watt hours of energy. but do that for one hour = 36,000 litres or 36 tons of water to get about 1% of the energy in 1 kg of petroleum (or 4% of delivered energy in auto use). AND hydro is "easy and cheap". We know that PV needs subsidies / FITs etc to compete. And that eg the Chinese government are essentially subsidising ALL the still surviving Chinese PV makers makers. The "problem" is that we value energy at the hydrocarbon equivalent value to our society and until we are willing to bite the "pay what it really costs" bullet alternatives will remain marginal or of negative value. Alas. [[FWIW: I design/make small solar products, manufactured in China (at present) for developing country use. So I watch what solar and similar costs and where it is going. So, sometime. But not yet. Despite what the downvoter may think :-). ]]. Note that people in the US who cover their roof with PV usually are happy with the payback. The feed in tariffs, purchase subsidies and lack of costed labor for eg panel cleaning, mean that they may get $ for $ break even in the 5 to 10 years range.But add some discounted cash flow cost-of money calculations and take away the various subsidies (including those by the Chinese government) and you find that PV are at best fighting neck and neck with traditional systems when areas of good sunshine are available, or losing out in real terms. Not the answer you're looking for? Browse other questions tagged energy economy zero-energy or ask your own question.